Kirjoitan kirja-arvosteluja toisessa blogissani nimeltä Web Wanderer. Urheiluun liittyvät arvostelut olen postannut myös tänne. Tässä viimeisin, arvostelu Daniels' Running Formula kirjasta englanniksi. My latest reading was a sports training book for a change. I've read about triathlon and swimming training, so it was time to concentrate on running. 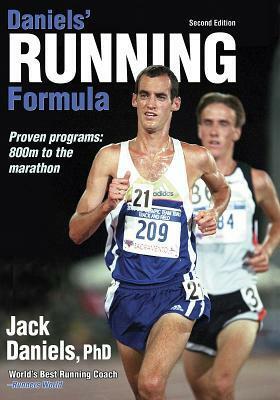 I got my hand on, what was said to be the best running training book ever made, Jack Daniels' Running Formula. Jack Daniels is a professor of physical education, coach of Olympic athletes and olympic medalist himself. That was proof enough for me, to take a closer look on his ideas. For me there were two important things in this book. First one was the idea of training load. I've understood that there is different load for different type of exercises, but this book got me to understand more about it and quantify the loads to some extend. I took that part directly in to use on my training diary and will use it for this training season to know if it really works or not. Second important thing in this book was the different running speeds and the VDOT index for those. VDOT wasn't totally new concept for me, but since it was invented for this book I got to understand all the background information behind it. Other than just running speeds, it gives pretty good tips for different type of running trainings. Running speeds in VDOT are Easy, Maraton, Threshold, Interval and Repetition. From those, the separation between Interval and Repetition was not clear to me at all before this book. No it is much more obvious that those exercises and speeds are for different purposes; Intervals for training VO2Max and Repetitions are for speed and technique. Big part of the book is also training programs. There are training programs from elite athletes to first time runners. Training programs also varies from short 800m runs all the way to marathons. So there are training programs for everybody, except for triathlonists. For me the best thing about training programs was to get some good ideas what kind of exercices could be done. From content point of view, book was excellent. It's filled with good information and ideas about running training. Then from editoral point, it was bit messy. It wasn't as easy and pleasurable to read as it could have been. I blame publishers for that one. They should have put more focus on readability. I still recommend this book to everyone who wants to understand running training. It gives such a good information about the endurance side of running training, that it is valuable to read. It's also quite quick to read, so I recommend to get it in to your hands and at least scim it through. Tämä on alunperin postattu toisessa blogissani täällä.